As you can tell from my blogroll on the right hand side of this site there is a long lost of blogs about aviation that I read on a regular basis. I was thinking this afternoon that it would be fun to have a visual reference of aviation blogs. This way a pilot could find an aviation blog written by someone in their area. Or you could look for a blog in a region you hope to fly too. I thought it might bring the aviation blogger community closer. So I have created a group called Flight Blogs at Frappr. If you publish a blog about aviation create an account and then enter the zip code for your hometown airport. 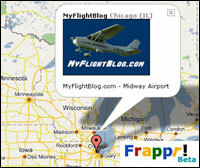 Next in the message area list your blogs URL and your home airports name. Add your aviation blog today! I have personally thought that some day all the aviation bloggers should get together and have a little fly-in sometime. A great excuse to add some time to the logbooks. Just feel it would be cool to meet in person someday to put a face to all these great stories people post. I dont know if you've ever been to this site but www.jetcareers.com helped me alot with my training, there is alot people that have been through it all on the forums! MIDWEST BLOGGER/PODCASTER FLY-IN!!!! I'm in!! !